Apple on Tuesday updated its Maps Flyover availability webpage to reflect the addition of 21 cities including multiple destinations in France and a handful of sites in Mexico, among others. The Normandy American Cemetery and Memorial in France. 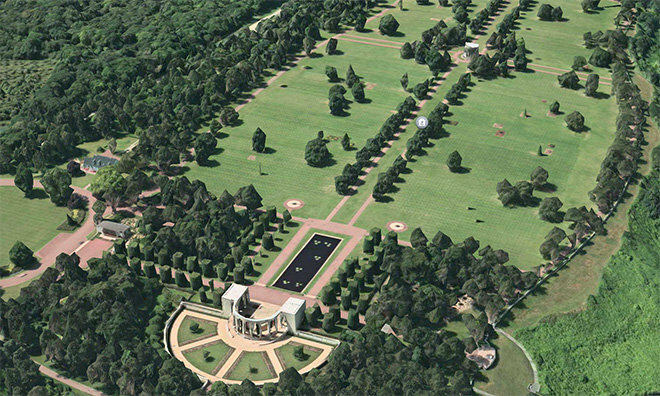 The additions come as part of an ongoing project to build out Apple's mapping service, which boasts 3D Flyover views as a standout feature in comparison to competing offerings like Google Maps. For its Flyover technology, Apple merges high-resolution aerial imagery with three-dimensional digital modeling to provide users with 3D visualizations of structures, landmarks and other points of interest. The view is also incorporated into Flyover city tours, which are available for highly trafficked locales and tourist destinations. Aside from Flyover, Apple is slowly introducing new features to its in-house mapping solution, one of the more recent highlights being transit directions in iOS 9. In February, Apple revealed a ground-based initiative that uses vans to collect what appears to be image and positioning data, hinting at a potential Google Street View competitor. Apple last updated Flyover in June with the addition of seven cities in Spain, Germany, UK and Puerto Rico.